I know it’s not sugar, but humor me, mmkay? I just did a ton of research and made my first business cards so I thought I’d share the knowledge! 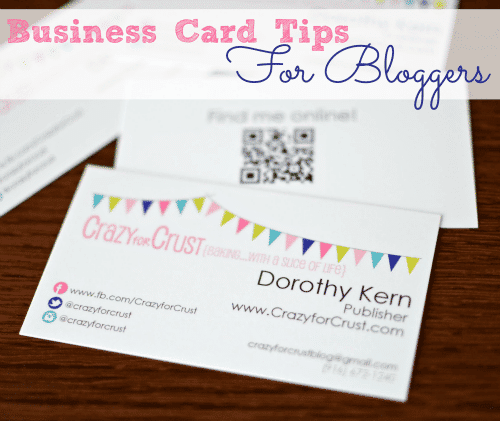 If you need business cards, you’ll want to read my 5 Tips for Blogging Business Cards! Blog conference season is upon us! There are so many conferences in the coming months, it’s almost overwhelming. I’ll be at Bloggy Boot Camp in Phoenix in April and BlogHer Food in Austin in June, which is probably plenty, but every day I hear about another cool conference I just want to go too! Now it’s 2013 and I’m going to two conferences. I needed business cards and I didn’t want to print them myself. I did some research on cards and where to get them and what to put on them. I’m so happy with the way mine turned out, that I thought I’d share a few tips with you today, in case you’re in the place where you need business cards too! 1. Where to get them? I ordered my cards from GotPrint.com (which, weirdly, has the web address gotprint.net). I came across a recommendation from them from Julie at Table for Two. They’re the only place I’ve ever ordered cards from, so I can’t compare too much. My experience with them was great. And they were super affordable: it was less than $15 for 250 14lb weight glossy business card, double-sided with color printing on one side and black and white on the other. ($9 for one sided.) The cards are heavy, smooth, and beautiful. The colors were what I was expecting too. Other companies I’ve heard about are Moo and Vistaprint. Moo looked great but was significantly more expensive. Vistaprint is a very affordable option but I don’t think the cheap ones come in glossy (that I’ve seen anyway). Where did you get your business cards? Someplace else? Let me know in the comments! 2. Make them pretty – or at least make them YOU. 3. What should you put on them? Obviously, you need to have your name, blog URL, and email address on your cards. I also highly suggest putting some of your social media accounts on them too. I chose to do Facebook, Twitter, and Instagram, since those are the easiest for people to use on their phones or tablets. Facebook tip #1: did you know that, to save space, you can put www.fb.com instead of writing out facebook.com? It totally works! For example, I put www.fb.com/CrazyforCrust on my business cards, instead of www.facebook.com/CrazyforCrust. It really saves space! Go to your Facebook Page. Click Edit Page (at the top) and select Update Info. The second section down is for Username. Select a username – I chose CrazyforCrust because it matched. Luckily it was available! Your old page address (with all the numbers) will now be redirected to the one using your username – and no numbers! Wondering if you should put your phone number on your business cards? Read on! I really struggled with putting my cell phone number on my business cards. I’m fine with giving out the number to PR people, but on my business card? Who knows where those will end up! A QR code is one of those funny looking not-a-barcode things you see all over the place now. You scan them with your phone and they take you to a website or an email or so many other things. Did you know you can generate a free QR code to put on your business cards? I had never thought about it, but thought it was a cool idea. I got my free QR code at QR Code Generator. Just follow the prompts and download your free code. Now, I don’t suggest putting the QR code on the front of your business card. You totally can, but I think that would take up valuable real estate, where you want your social media and stuff. I put mine on the back of my card and linked it to my blog. That way, when I give out my card, all they have to do is scan it with their phone and they go to my site. Pretty cool! I hope this post helps those of you who are thinking of getting some business cards for your blog! Once you have them, you’re going to be dying to hand them out! Even if you don’t think you need them, you totally do. What do you have on your business cards? Any other tips I missed? Feel free to leave advice in the comments! This post may be linked to: Chic-and-Crafty, I’m Lovin’ it Fridays, Weekend Wrap Up Party, Sundae Scoop Link Party, and all of these too! Thank you for sharing such useful tips with us. Having a business card is a great way to market your business. 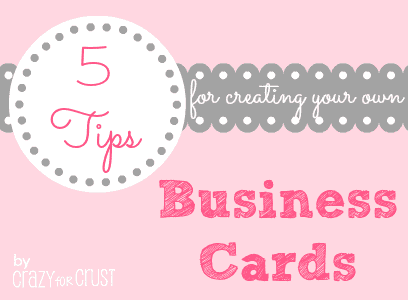 I will definitely use these tips for my next business cards brisbane project. Keep it up! I will provide you a premium and professionally designed business or luxury card which will make a long-lasting impression to clients They will not be able to throw it even after the work is done Because of the love of design. I got my metal business cards from http://www.metalkards.com and they were great, best customer service and I don’t usually leave reviews. I keep my design simple and elegant. I normally prefer to design my cards with the help of illustration given on the online websites. And I want to thank you for sharing this blog. I will going to save them for future reference with business cards brisbane project.. Thanks! Great tips about business cards..
Wow! Great information. I appreciate the information, but a big thank you for including images! I had no idea there were so many different types of business cards available. Keep on sharing.